Jean and Joan, though disappointed their clothes hadn’t arrived, joined in the excitement of opening our package, eager to see what she had ordered. “Well, at least she got you a decent-looking skirt,” Jean said. “But it’s all wrinkled,” I complained, holding it against my waist. Betty and I started back to school just before the end of harvest. Jean and Joan were left with a few more days of work. After they were through handing leaves, they walked down the road to meet us as we trudged home from school. “Well, we can only guess what lies the Benders told them,” Jean said. “But I miss Marie’s breaded chicken now that she’s gone,” Betty complained. to think about the breaded chicken. I was already hungry enough. “Well, I’ve almost worked up enough nerve to ask Mrs. Bender if she doesn’t say something soon,” Jean said crossly. “I hope so. Guess we’ll know soon,” I muttered as we turned into the driveway. We couldn’t find them anywhere in the backyard, so we went inside. Mrs. Bender was sitting at the kitchen table sipping tea, apparently waiting for us. “But we didn’t even get a chance to say good-bye!” Betty whimpered. “I thought it would be best this way,” she replied flatly. “Will we ever see them again?” I sputtered. Unable to fathom everything, we hurried into our sisters’ room, desperately hoping they might still be there. But it was empty and freshly swept. Nothing was left but the old linoleum in the middle of the floor. “Look,” I said, “they’ve taken away their old bed! That’s why Mr. Bender said that it would have to do for a while longer, and that’s why theirnew clothes never arrived. They were planning this all along.” We had it figured out now. We scoured their room, looking for something they might have left behind—anything to hold on to—but there was nothing. Not even a bobby pin. We then checked under the linoleum hoping to find a note they may have hidden for us—but found nothing. Our spirits broken we returned to our rooms, threw ourselves across our bed, and wept bitterly. Nothing could have prepared us for this horrible turn of events, and nothing could have equaled the pain we felt by having our sisters torn away from us once more, leaving us wondering whether we’d ever hear from or see them again. My anger had grown toward the Benders because they had made me repeat the eighth grade, and it now turned to hatred because they had sent our sisters away. We felt lonely at dinner that night, the table seeming twice as big without them. Noticing our sulkiness as we picked at our food, Mrs. Bender set her lips in a tight line and dug in her handbag for some loose change. “You’d better find time to take these girls to the movies today, Jim. Why, I swear, I’ve never seen such sour pusses in all my life!” We enjoyed the movies, but nothing cheered us up for the loss of our sisters and all the things we had enjoyed together We would never listen down the stovepipe again. Instead, we waited impatiently every day for some news from them. As winter came and the days grew cold and gray, we helped Mr. Bender dismantle our bed and move it into Jean and Joan’s room. “This room with the stovepipe will be warmer for you during the winter,” he remarked as he left the room. It was almost Christmas when Mrs. Bender handed us anenvelope, saying that it was from Jean, and it was evident that she had already opened it. It contained a Christmas cardwith a letter inside. Sitting side by side on our bed with our backs against the wall, we read it over and over, laughing at her funny remarks as she described her new home: We even have an inside bathroom here with a flushing toilet to boot. Yesterday I had a bubble bath in a real tub with real taps where hot or cold water comes out. Why, I swear to you, I’ve never been so clean in all my life. I even got the map of the world off the back of my neck. I was puzzled over this news and wondered why Mrs. Bender never let us have a bath. Jean went on to tell us that she lived with an older couple; that Joan lived with a family a few miles away; and that on Sundays they’d walk to meet each other halfway and visit They were both happy, but Joan had four young children to help care for and was quite busy. I help out around the house and am learning how to cook and clean. I even get to eat with the family. Come spring, I might be looking for work in town. Joan and I won’t be attending high school; didn’t much like school anyway. My heart sank as I read the last part. The very thought of not going to high school was almost more than I could bear. “I’ll throw myself across the railroad tracks if they don’t let us go!” “Maybe the Children’s Aid will take us away too,” Betty mused. At breakfast Betty handed the letter to Mrs. Bender for her to mail. We waited eagerly each day for another letter from Jean or perhaps one from Joan, but nothing arrived, and we never heard from them. Christmas Day came, and we were hoping for some extra privileges now that there were just the two of us. Perhaps we’d be allowed to eat Christmas dinner with the family, we thought, but it didn’t happen. We were called down for our usual bag of nuts and fruit, and May gave us each a chocolate bar. Minutes later we returned to our room and waited impatiently for our supper plates to be put on the bottom step. Near the end of January, the social worker stopped by for a visit, and for the first time ever, Mrs. Bender let us sit on the sofa in her living room. She had already primed us as to how we should answer any questions, so we felt very awkward and uncomfortable as we sat on the edge of the seat and tried to answer the questions the lady asked. When the ordeal was over, we returned at once to our room. The Children’s Aid Report stated: We saw the girls and find it difficult to discuss their ideas as they appear too painfully shy and unable to express themselves, but sit stiffly, glancing at the foster mother and often merely smiling in answer to a question. We are not sure what is the cause of this subdued manner. There is a certain furtiveness in Mrs. Bender’s manner that is disturbing, though this may be her natural way. Bonnie Virag has lived the life of a foster care child being bounced around from one foster home to another mainly for the work and money that foster parents could extract from the system. 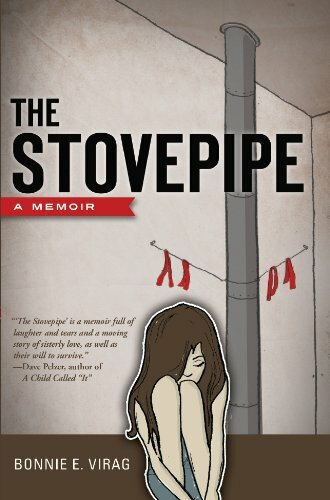 I feel these life experiences give me the necessary credentials to write my book: The Stovepipe.